One of the first things I noticed when moving into our apartment was a little Italian place in nearby. The first time we checked out their food is when Tom’s parents were visiting. They arrived late and Tom and his dad got to work on hanging the ceiling fan, so we decided to go pick up some food instead of going out to dinner. We were completely impressed with our first meal, a pepperoni pizza for Tom and his dad, a cold cut for his mom and a cheese steak with mushrooms, bacon and green peppers for me. They also sell something that makes me incredibly happy…sorbet in fruit…like the lemon in a lemon cup story I shared with you. The second time we ordered from them I tried their white pizza which comes with mozzarella, ricotta, chicken, sliced tomatoes and sauteed spinach with a garlic sauce. Incredible. The third time we ordered from them, I chose this sandwich. It was so good, less than two weeks later I decided to re-create it at home. 1. Preheat a panini press. 2. Drizzle the olive oil over each roll or slice of bread. Brush in. 3. Divide the prosciutto among the sandwiches. Top with the spring mix, tomato sprinkled with salt and pepper, a basil leaf and two slices of mozzarella cheese. Repeat with remaining sandwiches. 4. 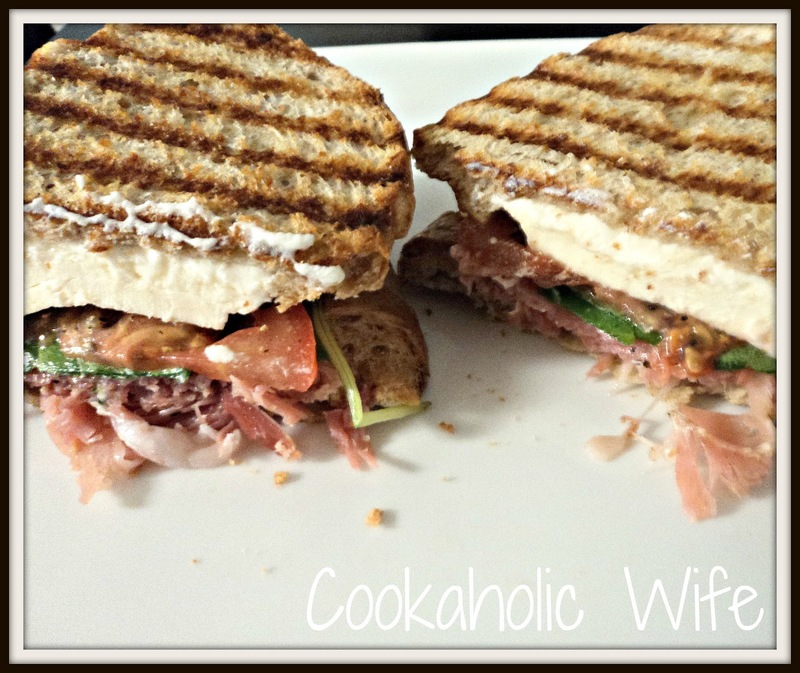 Place sandwiches on the panini press and cook for 5-7 minutes or until the mozzarella is slightly melted and the bread is lightly golden. Serve immediately. I didn’t expect it to be so easy to re-create at home but the flavors were spot on. I ended up using whole wheat Italian bread cut into thick slices because I couldn’t find ciabatta or other hearty rolls anywhere. The saltiness of the prosciutto just goes so well with the fragrance of the basil and sweetness of the tomato. 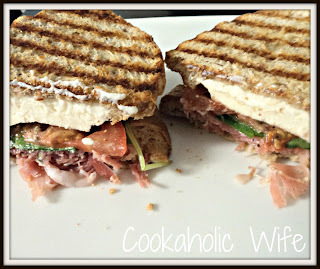 If I could carry a panini press amount in my back pocket, I’d eat these sandwiches daily.